Still need to sort your Christmas food? We’ll deliver your whole organic feast in one box, in time for the big day. 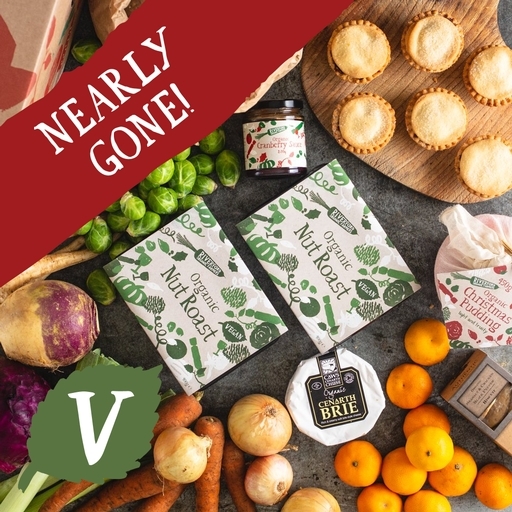 It’s packed with everything you need for a very special vegetarian feast: a medium veg box packed with festive favourites, 2 rich nut roasts and fresh, tangy cranberry sauce. For dessert, 6 mince pies, a traditional Christmas pudding, and 600g clementines. And to finish, simple-yet-satisfying sea salt and cracked black pepper biscuits, and creamy Caws Cenarth brie. Mince pies, Christmas pudding, nut roast and cranberry sauce are all handmade to our own special recipes by our friends at The Authentic Bread Company, Pegoty Hedge and Kitchen Garden. Creamy brie is from Caws Cenarth in Wales, and the savoury biscuits are The Authentic Bread Company’s finest. Vegan nut roast: Butternut Squash, Amaranth, Walnuts, Cashew Nuts, Chestnuts, Onion, Celery, Carrots, Almonds, Brown Rice Flour, Sunflower Oil, Lemon Juice, Garlic puree, Brown Rice Miso (Whole Soya Bean, Cultured Brown Rice, Sea Salt*, Water*), Worcester Sauce (Molasses, Tamari Sauce (Soya Beans), Sugar, White Wine Vinegar, Garlic puree, Water*), Parsley, Tamari Soy, Vegetable Bouillon (Rice Flower, Sea Salt*, Maltodextrin (from Maize), Vegetables (8.3%) (Onion, Carrot, Parsnip, Pumpkin), Yeast Extract, Sunflower Oil, Turmeric, Mushrooms (White, Shitake), Parsley, Concentrated Vegetable Juice (Onion, Carrot), Lovage, Garlic, Fennel Seed), Dried Mixed Mushrooms, Rosemary, Salt*, Black Pepper.